Capable of producing over 300 edge-glued panels per shift (3 panels per section x 14 sections x 8 hours), the 14-Section Clamp Carrier is ideal for the mid-size cabinet or furniture shop. 14-Section Heavy Duty Clamp Carriers are available in widths (maximum stock length capacities) of 6.5', 8.5' or 10.5'. The 14-Section Carrier can be expanded to 20 sections at a later date, if desired. To view a high-resolution photograph of a 6.5' wide, 14-Section Clamp Carrier with standard frame and Hydraulic Clamp Tightener, please click on the image to the upper left. To view a high-resolution photograph of an 8.5' wide, 14-Section Clamp Carrier with heavy-duty frame (see below) and Pneumatic Clamp Tightener, please click on the image to the left. 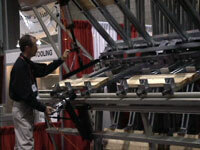 Two different frame configuations are available for our 14-section Clamp Carrier. The economical frame has 2" diameter front and rear shafts, cast iron sprockets, high-strength chains with 1.5" wide rollers, and 2" x 4" structural steel tubing legs. 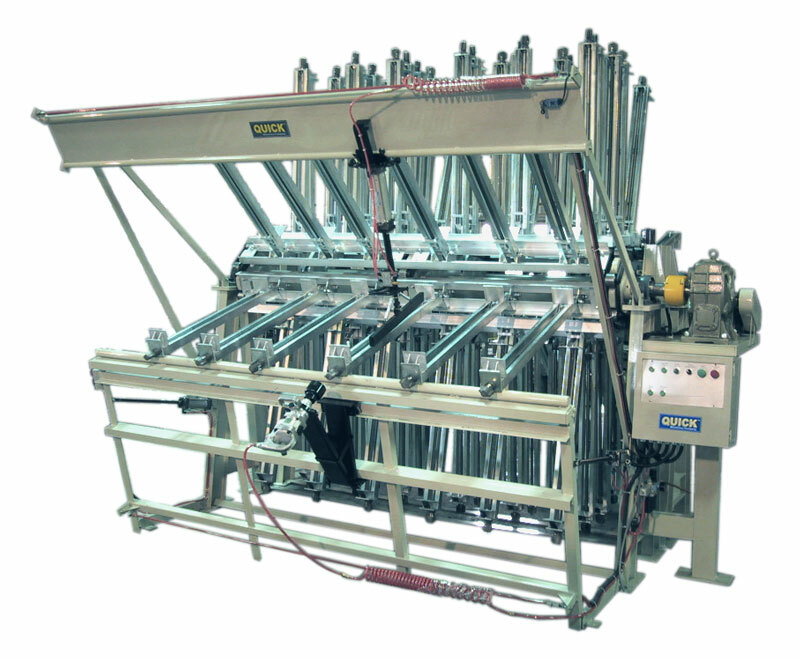 The economical frame is more than strong enough for most high-production edge-gluing applications. 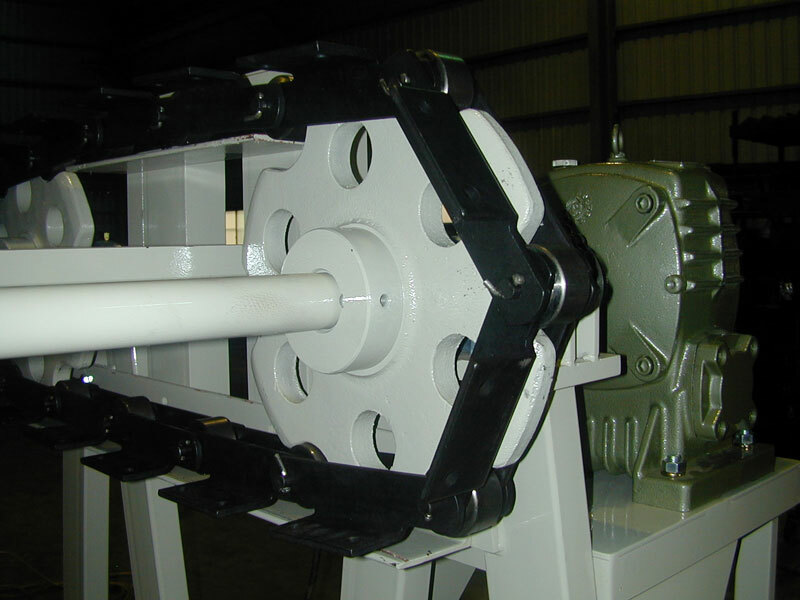 The heavy-duty frame for our 14-Section Clamp Carrier uses the same materials and components as used on our 20- to 80-section machines, with massive 3" diameter front and rear shafts and 6" I-beam legs. 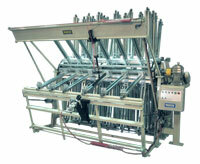 This heavy-duty frame is used mostly for machines that are going to be face-gluing very heavy material. 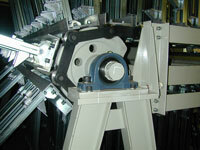 To view a high-resolution photograph of a 14-Section Clamp Carrier standard frame, please click on the image to the upper left. 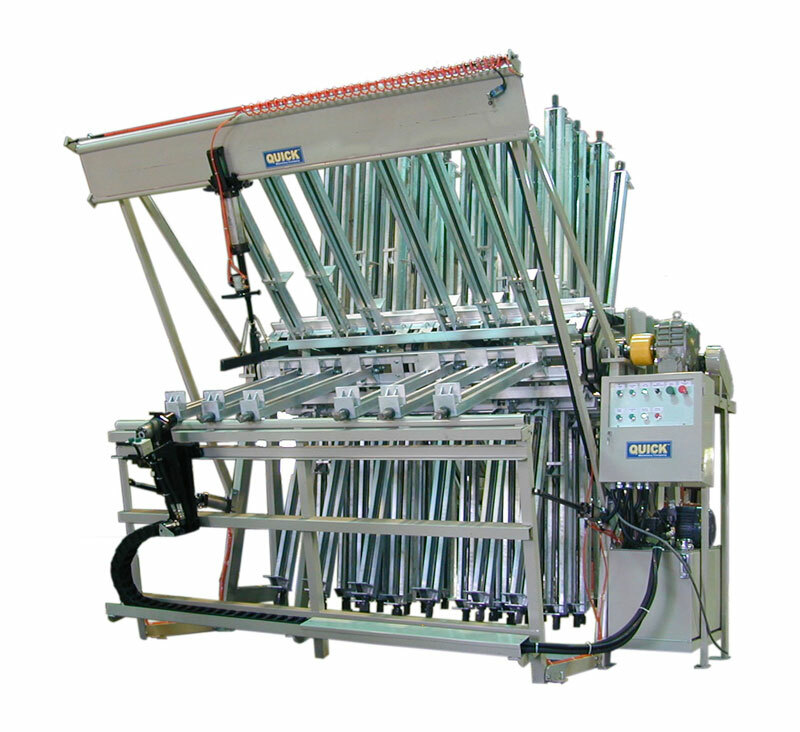 To view a high-resolution photograph of a 20-Section Clamp Carrier frame, which uses the same materials and components as the 14-section heavy-duty frame, please click on the image to the left. To view a movie of a 14-Section Heavy Duty Clamp Carrier with Pneumatic Clamp Tightener in operation, please click on the image to the left. To view a movie of a 14-Section Heavy Duty Clamp Carrier with Hydraulic Clamp Tightener in operation, please click on the image to the left. 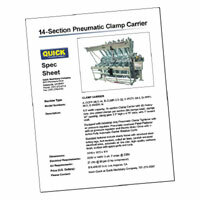 To download a PDF version of our 14-Section Heavy Duty Pneumatic Clamp Carrier Spec Sheet (1.5 mb), which includes specifications, electrical and air requirements, dimensions and example pricing, please click on the image to the left. 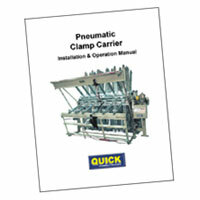 To download a PDF version of a QUICK Pneumatic 14-Section Clamp Carrier Installation/Operation manual, please visit our Manuals page by clicking on the image to the left.